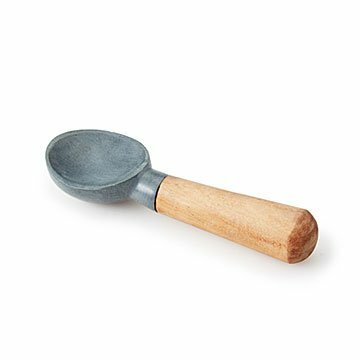 Get an inside scoop on serving ice cream with this heat-absorbing soapstone server. This handsome server harnesses the thermal properties of soapstone to give you an exclusive scoop on serving ice cream. Just run the soapstone scoop under hot water to tackle a tough pint of ice cream without waiting for it to soften up. The handle is made of contrasting ash wood for a comfortable grip and organic appeal. Designed by Steven Chavez and Justin English; made in India. Pair your Soapstone Ice Cream Scoop with our Hot and Cold Soapstone Bowls - Set of 2. Run under hot water for thirty seconds before using. Hand wash after use. Not intended to be placed in the oven, stove, or microwave. Loved the look of this, and the multi-material finish. However, the scoop is just glued together so it broke after second use! Had bought as a gift as a set with the matching bowls. Just received the bowls; hopefully they will not have similar issues. To the credit of Uncommon Goods, I called to report this, and they offered either a refund or a replacement with no hesitation. (I took the refund). Love that kind of service and standing behind the products. I have purchased many other gifts from this company previously. I bought this for my brother for Christmas. He was excited about it and loved the look and feel of the product, despite its somewhat fussy nature (unable to be cleaned in the dishwasher). Unfortunately, his second time using the scoop, the soapstone scoop piece broke clean in half as he was scooping the ice cream. He has the gift receipt so I'm hoping he can get some kind of replacement or credit, but I am very disappointed and feel terrible that his gift broke so quickly. I would never order one of these for someone again and unfortunately this makes me very wary of ordering other breakable utensils/kitchen tools from Uncommon Goods in the future. I have to say it is pretty embarrassing when you give a gift to your in-laws and the product basically breaks into two pieces. This scoop was purchased with the 2-bowl set as a Christmas gift. The scoop is only glued together with no other means of attachment. This never got used and broke in their hands in front of everyone. I have posted a photo to show how the two pieces are only glued together. There is very little surface area for the glue to hold to. I would think there should be a way for the soapstone portion to screw into the wood handle. Very disappointed in the construction. Needless to say this will be returned or exchanged (maybe the design has been improved?). Love how it looks. Easy to clean! Best Ice Cream Scoop Ever! This scoop is not only beautifully constructed but is unique and very functional. In my daughter's words...."best ice cream scoop EVER"! Given as a gift for a couple that like unique and different from standard items. I purchased this for my Dad for Christmas and the head broke off after a couple of uses. The head was also very flat, so he had a hard time getting ice cream on it. It was pretty to look at but not functional or good quality. It's beautiful! I like everything about it except the scoop is rather flat... not deep like the photo online so it doesn't scoop well. The ice cream comes out like a slab verses a round ball ... otherwise I would love it. I haven't used this yet, so I'm not sure how it holds up or how well it works. IT LOOKS GREAT! It's nice and heavy. I'm excited to use it! The reason I didn't give 5 stars is because where the different joints of materials meet, there is a little gap. It's not the MOST attractive at those two points; it's a little messy.. But maybe I'm being picky. From a cpl feet away, it's adorable and perfect!